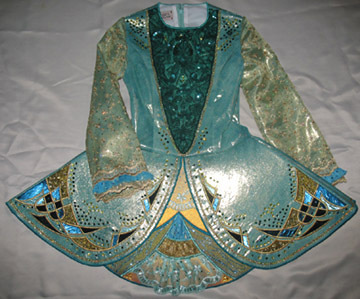 “Spring #1″ (as named by Rachel Murphy) is made of a shiny aqua-green-gold lycra with a swoop skirt, and holographic-dot nettings in gold, turquoise-blue, and aqua green. 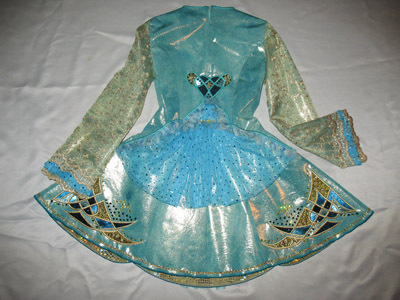 The appliquÃ© metallic fabrics are in similar shades. 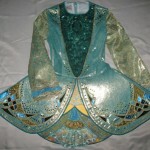 The green bead-and-sequin overlay on the bodice is bordered by gold trim with a rainbow shine. 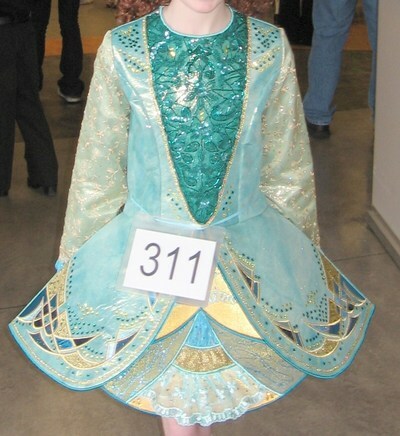 It is a lightweight dress for a younger dancer, with stiffening in the front skirt, and a soft skirt back. The skirt lining/bloomers are made of a holographic gold liquid lamÃ©. 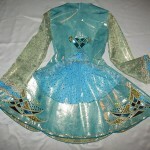 The dress is accented with hundreds of Swarovski (genuine Austrian) crystals in Emerald and Citrine (yellow-gold). Asking Price: $US350. Shipping costs are not included in the asking price. Returns are negotiable.